‘…The intense darkness engulfed the dinghy. Wave after wave crashed heavily along the sides, the spray soaking the passengers. Four dozen people crammed into the craft as its grossly underpowered outboard engine struggled to make headway against the roiling water. The promised lifejackets had not appeared prior to setting off from the Libyan shoreline two hours earlier, but desperation to make the journey had overcome the hesitation to board. A new life beckoned at the end of the voyage. Several families and a few young, single men had clambered in and arranged themselves to balance the dinghy as they pushed off. The handlers told them the crossing would take no more than three hours. The safety of the coastline of Italy beckoned across the pitch-black night. Parents hugged the younger children tighter with words of reassurance they were almost there. With each successive pounding from the sea, many of the children began to cry. The sweeping searchlight from the approaching coastguard vessel picked them out just before the huge, rogue wave hit the craft broadsides. The slew of bodies from one side to the other was too much to keep it stable. The inevitable capsizing turned the dinghy upside down, pitching everyone aboard into the water. The screams were inaudible against the screeching wind as the crew on the cutter reacted as swiftly as they could. Less than fifteen passengers were pulled aboard alive. Deterioration in the weather made rescue efforts increasingly hazardous as the coastguard men retrieved seven bodies. An estimated further two dozen souls drowned. The captain decided further recovery was impossible after half an hour and headed back for the Italian shoreline. Papa, truly, truly I am scared. Seumas! What a sad and moving poem. You know what I want to say/ask… but I won’t because you’ve turned us down before, but Colours of Life would greatly benefit from the music of your verse. Sad and rings so true. Thanks, Seumas. 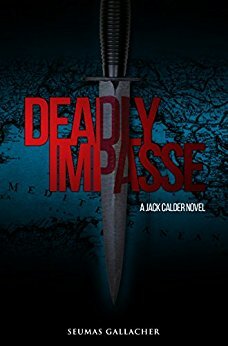 Check out this sample of the boook, Deadly Impasse, by Seumas Gllacher, from this post on his blog. I can’t lie. Jayden K. Smith hacked into my account and reblogged your post 🙂 He says, you’re welcome.